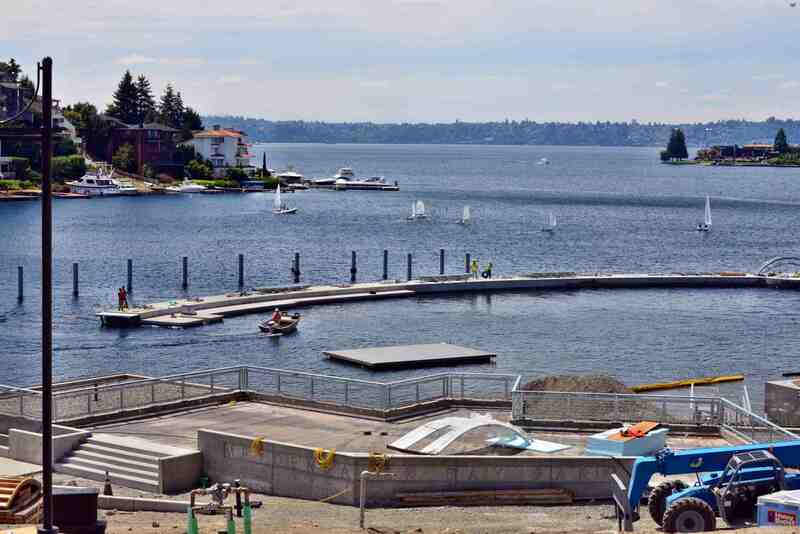 The City of Bellevue, Washington, is wrapping up the first phase of an expansion and renovation project at Meydenbauer Bay Park. As part of the project, Bellingham Marine built a unique curved dock that will serve as a kayak launch, pedestrian walkway and wave attenuator. Bellingham Marine has constructed curved docks before, but those were typically made using trapezoidal shapes to produce the curve. 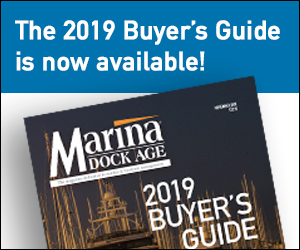 “This was the first dock the company has done with curved post-tensioned concrete,” said Rob Rasmussen, general manager, Bellingham Marine. To ensure that the dock would float level and true, the company used 3-D modeling to help design the structure, which is 270 feet long and 10 feet wide. Because of the massive size of the dock, Bellingham built it in sections at its manufacturing facility and then trucked the sections to Kenmore, Washington. 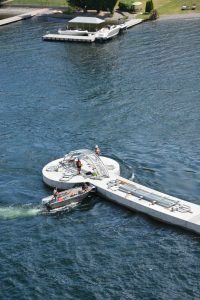 There, the company’s crews launched the sections into the upper end of Lake Washington and assembled them into a single post-tensioned dock. The entire structure was towed six miles to Meydenbauer Bay Park and anchored to 16-inch piles. “We had a lot of coordination with the general contractor, IMCO General Construction, on this, and everything fit exactly as it was supposed to,” Rasmussen said. Work was completed in October. One end of the dock features a circular, 25-foot-diameter viewing platform. “This was made in three pieces, a rectangle with a rounded end and two half-moon shapes attached to either side,” Rasmussen added. “When you put those half-moons in the water they wanted to roll, so it was technically challenging to assemble.” The circular section features a large sundial in the center and pile caps with seagull sculptures. The dock also includes a galvanized handrail and an all-aluminum ADA-accessible kayak launch. The wave attenuator will help protect the swimming beach and the newly restored areas of Meydenbauer Bay Park from the wakes of the large boats in the area and the potential for wind-generated waves from the southwest.